Villas at Cap Maison feature private rooftop plunge pools. Located on Smugglers Cove Beach with scenic views of Martinique and Pigeon Island, the boutique Cap Maison features two great restaurants, three bars, a full-service spa, and non-motorized water sports. Room categories at Cap Maison include standard rooms nestled in the resort’s tropical gardens, suites with garden or ocean views and private balconies, and ocean view villas with rooftop plunge pools. 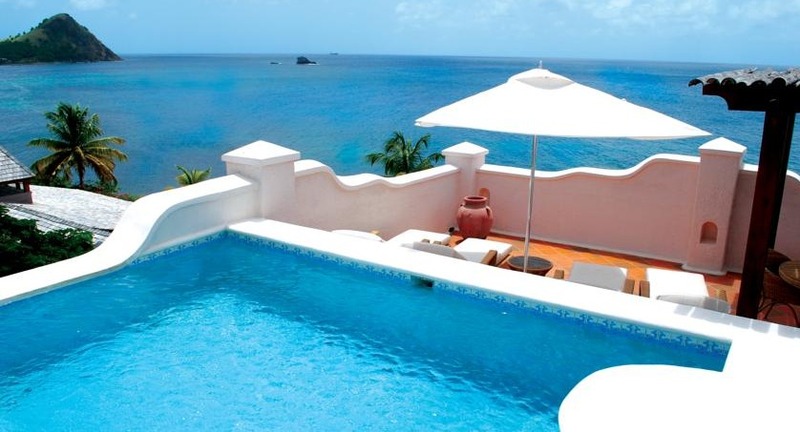 Cap Maison offers all-inclusive packages with meals and drinks included. Casual dining is offered at The Cliff at Cap for breakfast and lunch. It serves French West Indian cuisine and features fine dining for dinner. Theo’s Bar is air conditioned and includes game tables while Smugglers Beach Bar is located on the beach. The well equipped gym at Cap Maison Resort offers yoga classes. A water sports facility is also onsite along with an outdoor pool. Fly into Hewanorra International Airport (UVF), St. Lucia. Blu is located about 90 minutes from the airport. Visit Cap Maison’s website for more information.